The rainbow trout (Oncorhynchus mykiss) is native to streams, rivers, and lakes along the west coast of North America from Alaska to northern Mexico. This fish can live its entire life in freshwater when confined to land-locked bodies of water, but it also has a migratory form, known as steelhead trout, which feeds at sea before returning to its birthplace to spawn. The rainbow trout is notable because it has been widely introduced throughout the world – non-native populations can now be found on every continent except Antarctica. This beastie has made its mark on Whistler by way of a common misconception. Locals know that the name “Rainbow” can be found all over Whistler – Rainbow Mountain, Rainbow Lodge (now Rainbow Park), the Rainbow Building, and the new Rainbow subdivision. Many people (including the staff here at the museum!) believed until very recently that these places and landmarks were named after the rainbow trout, due to its natural abundance in our lakes and rivers. But early accounts of the area indicate that cutthroat trout (O. clarki) were the primary species being caught by early patrons of Rainbow Lodge, and that rainbow trout weren’t introduced to Alta Lake until the 1920s, nearly 10 years after the lodge was named! Whistler has a long history with fishing, as the fishing industry was one of the first attractions to bring in tourists. Rainbow Lodge was the first and only holiday destination built in the valley before 1914, when the Pacific Great Eastern Railway was built. At this time, other entrepreneurs began building accommodations most notably for fishing holidays. Now, we know that fishing was a main attraction in early Whistler days and that Myrtle and her guests were catching trout; however, our archival photos are not clear enough to determine the species definitively. 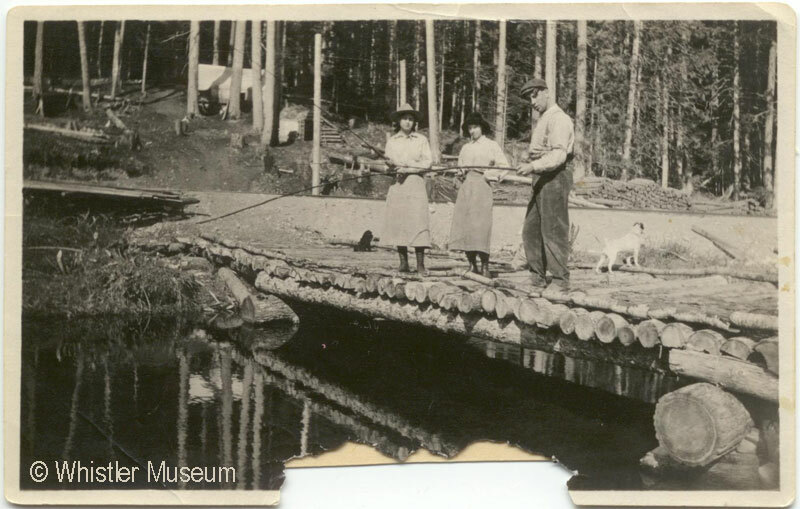 Margaret Tapley, Edna, & her husband Don McRae with dog Ki, fishing from the log bridge to Tracks, Myrtle’s tent house. 1915. Inscription reads: Rainbow 1915. One of Whistler’s earliest fishing enthusiasts, a Mr. Billy Bailiff, refers to “Kamloops trout” in his 1956 article, “History of Alta Lake.” This is a moniker given to rainbow trout found in the interior of British Columbia (particularly around Kamloops, believe it or not). Most introduced rainbow trout in B.C. are descended from the Pennask Lake strain, which is known for its ability to conserve fat, making these fish well suited for long winters and the low temperatures of high-elevation lakes – sound familiar? This strain is also notoriously “spirited,” meaning that they put up a good fight when hooked, much to the delight of the sport fisher. 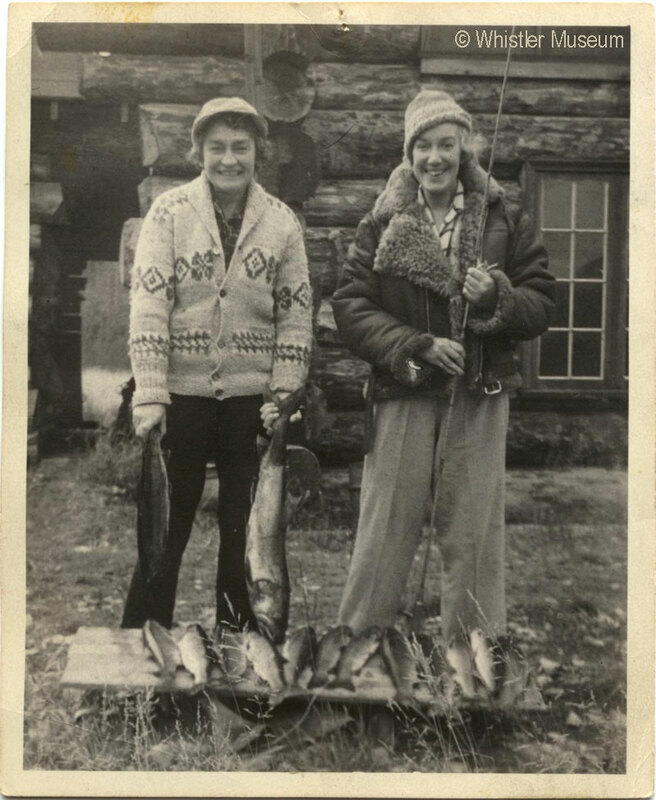 Myrtle Philip and Grace Naismith with freshly-caught large fish, Mahood Lake. 1949. So, then, how do we explain the ubiquity of the “Rainbow” label around town? It seems to have originated with the mountain, rather than the fish. How the mountain got its name is still uncertain. Perhaps the early settlers in the area were often treated to a rainbow arching over the mountain after a storm – sounds like a memorable sight! This entry was posted in Environment, Inside History and tagged Fish, history, rainbow trout, Whistler. Bookmark the permalink.